My own much briefer take: the Rabids are not very relevant. Ms. Marvel being nominated again is more important than ever given the nonsense going on – about diversity in comics, and using comics for political messaging, Ms. Marvel is basically the rebuttal and antidote. I enjoyed The Obelisk Gate, and haven’t read Three Body Problem yet so can’t speak to Death’s End. Since I am going crazy over the Expanse (both in TV format as well as devouring the novels), I am excited to see it in the new Best Series category. And Rogue One just wins for me for the Vader sequence alone. This year’s short list of novels, like the novella category, is a strong one, and like the novellas, the novels have a clear winner and a clear loser. The winner: The Fifth Season by N.K. Jemisin. 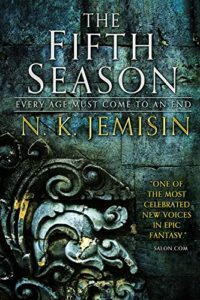 The Fifth Season is probably the best SFF novel, not of the year, but of the decade. Maybe it’s the best SFF novel of the century, although it’s still early. 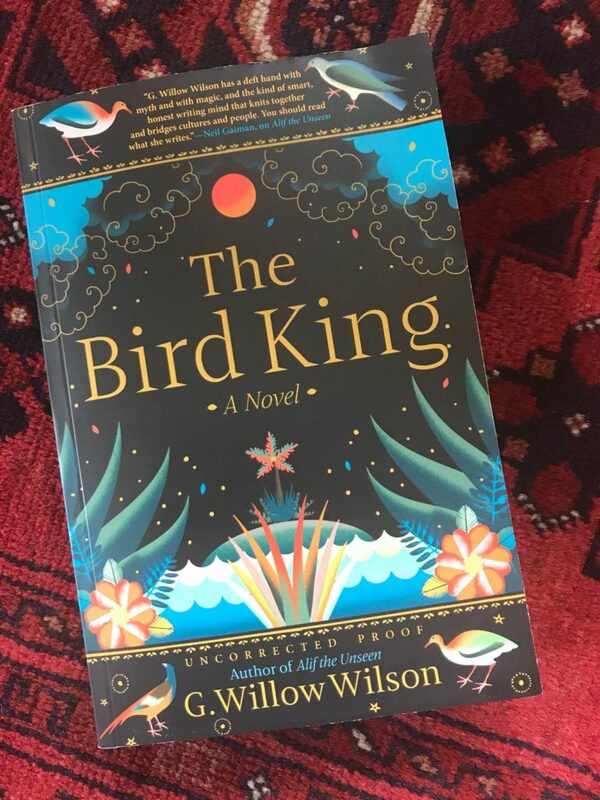 It’s pitch-perfect in nearly every way: the writing is lyrical in the right places and prosaic where it’s better brought down to earth; the fourth-wall-breaking brushstrokes and the shifts in viewpoint and tense are startling in exactly the right way; the characters are vividly drawn and the injustices of the world portrayed with nuance and moral strength. It’s long enough to do justice to its epic premise but not so long that the story drags. I could go on for days, but others have done so already. Even more than that, The Fifth Season, like all Jemisin novels but more so, is a master class in world-building. The Fifth Season sits somewhere on the uncertain border between science fiction and fantasy, and manages to build the kind of world that both genres are meant to explore. It takes its unnatural premises – what if the world suffered extinction-level geological catastrophes every few centuries and certain people had inborn power to control the earth’s movements? – and spins them out into history, politics, social organization and material culture that seem natural. The Fifth Season’s world is lived-in and is obviously thought through to the smallest detail; it’s a world in which readers can immerse themselves and from which the hidden stories that lie behind every novel come to mind unbidden. This is a masterpiece, and nothing else on the ballot comes close to it. The loser: Neal Stephenson’s Seveneves. This is a book that people seem to love or hate, and I hated it. I’ll give Stephenson credit for ambition, but unlike Jemisin, he couldn’t make it work. The walking-stereotype characters and the overtones of racial essentialism in the final part were enough for me to put it below No Award – the only novel this year to achieve that honor – and the bad science made it worse. 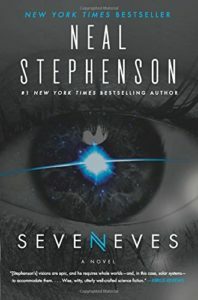 A word about bad science: hard SF authors often neglect the “soft sciences” such as sociology and linguistics, and Seveneves is a particularly bad example, all the more so since Anathem proves that Stephenson can extrapolate both hard and soft sciences. 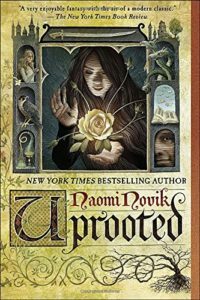 Of the remaining novels, Naomi Novik’s Uprooted easily takes the second-place slot. It’s a familiar fantasy with familiar tropes, but Novik manages to do a few new things with them. The writing is lucid, the setting well-realized, the characters sympathetic and well-drawn, the enemy evil and multi-faceted. 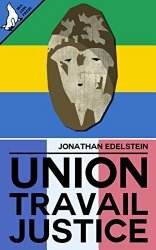 The conflict is a genuine contest of will, with an enemy capable of learning from its setbacks; the Eastern European setting complements the overtones of myth and history; the story is unpredictable enough to keep up nearly constant suspense; the resolution is both unexpected and satisfying. In a year without The Fifth Season, I might easily have put Uprooted at the top of my ballot; as things stand, it’s a strong runner-up. 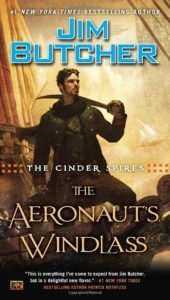 Jim Butcher’s The Aeronaut’s Windlass comes third. It’s an entertaining read: steampunk, flying ships and talking cats, what’s not to like? There are characters to root for and plenty of action. The single gratuitous political statement (about the Auroran enemy being driven to conquer because it has been bankrupted by its wasteful social-democratic ways) is mercifully short, and I suppose authors are allowed one of those every so often. But The Aeronaut’s Windlass is too long, the story lags in too many places, and in contrast to The Fifth Season, the setting isn’t fully realized and we see far too little of the strange world the characters inhabit. I like Butcher, but this isn’t his best, and I’m not sure I’d read the next book in the series. 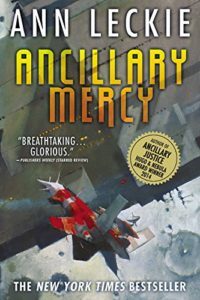 And finally, Ann Leckie’s Ancillary Mercy. I’ve never understood the appeal of the Ancillary novels – I’ve seen enough thoughtful rave reviews of them that I’m prepared to believe this is a failing of mine rather than Leckie’s, but I’ve never understood it all the same. Ancillary Mercy and The Fifth Season are both dense, but where Jemisin’s density is lucid, Leckie’s is opaque. Her world doesn’t permit easy entry, and she couldn’t make me care about her characters or about the conflicts running through their society. I can see the novel’s literary merit – no one would dispute that Leckie is a masterful writer – but I can’t sign up for the ride on which she wants to take us. Leckie can take comfort in the fact that many will no doubt rate Ancillary Mercy higher than I do. I am only about halfway through the original series and I have extensive notes that I want to put up online here. I am also greatly inspired by Auston’s and Jonathan’s examples. Watching Sanderson’s lectures break down the writing craft into what feels like more manageable pieces. These are essential viewing for anyone like me who has any aspiration to be a SF writer. The Hugo awards have completed, and it was a definitive rebuke to the Sad Puppy/Rabid Puppy slate. For a great summary, see this article in Wired; for reactions, see Mark (neutral), see Richard (pro-Hugos), and John Wright (pro-Puppies). 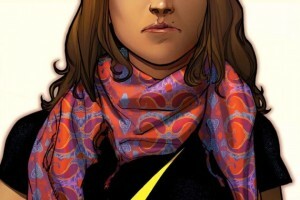 I’ve been mostly a lurker with respect to the whole Hugo controversy – though I did strongly support Ms. Marvel over at my non-geek-facing blog. I am grateful to Mike at File770 for due diligence in keeping all sides of the debate visible. I think that the main lesson here going forward is that the Hugos are vulnerable – relatively small numbers of people can influence the results. If nothing else, we should thank the Puppies for raising the controversy to the level of rallying people to participate. However, there does need to be a way to broaden the base to make the system immune to coup. The EPH proposal is a good start but it seems to me (and I may be mistaken) that it is designed as a band-aid to the problem arising from the vulnerability, not a genuine solution to that vulnerability. This is just 5 minutes of brainstorming on a blog post. 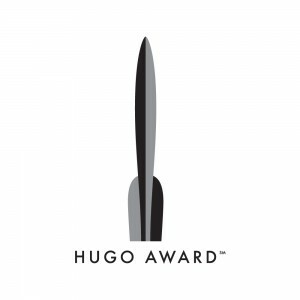 The point is that the official machinery of the Hugo Awards itself needs to start contemplating solutions to grow the base and keep the Hugos relevant to a broader swath of fandom than has been sufficient till now. I hope that this wasn’t a banner year for Hugo voting, but rather the beginning of a strong trend. If not, the Hugos really are in danger, long term.